‘Everyday cooking is about sharing your love of food with family and friends. 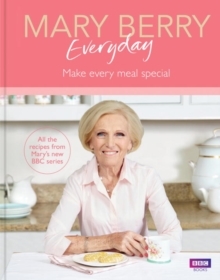 With this book I hope that you will feel encouraged to create new favourites, making everyday meals into something extra-special.’ Add a little Mary magic to your cooking with 120 brand-new recipes from the inspiring new BBC series. It includes delicious family suppers, tempting food for sharing and plenty of sweet treats, all made with everyday ingredients and a clever twist.